Katie Nelms played on Leland's varsity soccer team as a freshman before deciding to concentrate on track and field year-round. Although her track opponents might beg to differ, Nelms' decision has paid off. Now a junior, Nelms has developed into the most versatile female track athlete in the Central Coast Section. Nelms has the No. 1 CCS times in three events — the 200 meters (24.71); the 400 (56.67); and her favorite race, the 300 hurdles (43.57 at the Arcadia Invitational). She is second in the 100 hurdles (14.47) and the 100 (12.10). "When she came on board as a freshman she was primarily a sprinter," said Leland's Rudy Montenegro, who coaches Nelms in the hurdles while Jerry Rose helps her in the sprints. "But she has always been focused on competing at the highest level. We saw an opportunity for her to advance to state in the 300 hurdles. 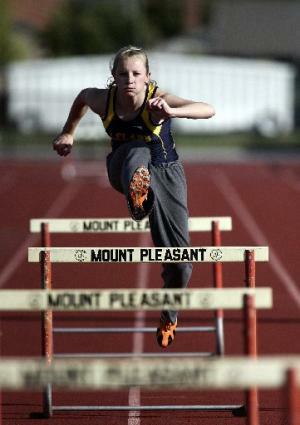 Ever since then she has loved the event — she wants to be a hurdler who happens to sprint well." Nelms earned her first trip to the state meet by finishing third in the CCS's 300 hurdles. Soon after her freshman season, she began working with a personal coach, Al Hill, and dropped soccer. "Talent tends to develop in context to interest," Hill said. "Katie was a real good soccer player and we didn't want to tear her away from the sport, but if she was really interested in track I suggested to give it a chance exclusively. ... That's why you see her excelling in five different events." College recruiters are taking notice. Nelms has received more than 30 letters from top track and field programs. She has a 4.2 grade-point average and hopes to find a perfect balance between academics and athletics. "I was OK at soccer, but I'm not the biggest person and it's a very physical sport," said Nelms, 5-foot-3 and 115 pounds. "I didn't know where that was going to take me, and I loved track so much. I didn't want to compromise that, so it was an easy decision." Her dedication to the sport paid dividends in her sophomore season when Nelms qualified for the state meet in three events by finishing in the top three at the CCS meet. Nelms was third in the 100 hurdles, second in the 100 and won her first CCS title in the 300 hurdles by more than a second and a half in 43.11. At the state meet, she ran a personal-record 42.06 in the 300 hurdles preliminaries to reach the final, where she finished eighth in 42.70 (her preliminary time would have been good for fourth). "The 300 hurdles is my favorite race," Nelms said. "I like the combination of speed and endurance. And if you make a mistake, there is time to make up for it during the race. That was my P.R. by more than a second in the first day of state, so it very hard to come back the next day and run that fast. "But I loved the pressure and intensity of running in a race like that with everyone watching. It pushes me to do better." Athletes can compete in up to four events in the CCS and state meets, and Nelms figures she will focus on the 300 hurdles, the 100 hurdles and probably one more event to be determined. The boys and girls teams are having an excellent season. Saturday the boys' 400 relay team ran at Arcadia and finished first in 42.02, the best in the CCS this year. Robert Fiscalini, Cameron Marshall, Mishawn Cummings and freshman Byron Marshall are members of the relay team. Byron Marshall is one of the top young athletes in California. His long-jump mark of 22 feet, 11﻿3/4 inches is tops in the section and ranked fifth in the state as of March 29. Junior Hannah Goranson finished fourth in the 100 hurdles invitational race at Arcadia with a CCS-best 14.28. Senior Jennifer Bergman holds the top CCS mark in the 3200 with a 10:45.92 recorded at Arcadia.